I'm a bit annoyed actually... I wrote a very heartfelt entry earlier, but Blog Press decided to erase it all when my Tom Tom app started barking directions at me. So this wouldn't be the same, and I apologise up front. Starting last Saturday, I've been shooting around South Africa with my friend who's visiting from Belgium. Our first stop was about 500 km out of Cape Town in the Land of Ostriches, Oudtshoorn on Sunday. 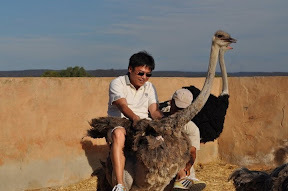 Following a swim with the crocodiles, my friend had his first experience to stand on an ostrich egg and we even raced the long legged birds at breakneck speeds. We flew into Durban on Monday evening. I haven't been there since the early 90s and I really forgot how humid the city was. That sudden waft of wet warm air hit as soon as I came out of the airport and the sweating started. 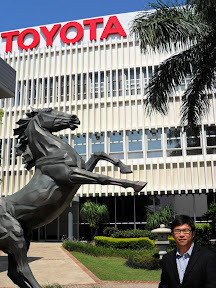 The next morning, we visited Toyota South Africa Motors plant in Durbz on a plant tour. Being able to visit the massive plant of my company in my home country was a wonderful learning experience. It was interesting to see how they work and understand more about Toyota in the local and African market. 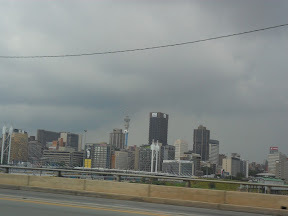 That afternoon, we drove out to Johannesburg. The scenery was stunning along the way. That evening we grabbed a drink and dinner at Montecasino before enjoying a pleasurable after dinner dessert (the hint is in that sentence - I will say no more). Now, at this point I must add that Jozie really wasn't as bad as everybody says. There were no issues with "security" and Sandton in particular was extremely pleasant. If you prat around stupidly in any major city in the world and not maintain a level of awareness and go to unsafe areas, whatever happens is your fault. Having not being in that area since the late 90s, I felt like a real tourist in my own country. But it was great to see how the city has evolved since I last passed through! 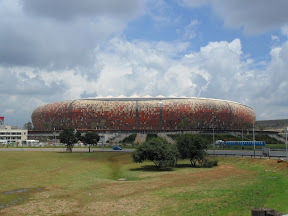 We stopped over at Toyota SA's Head Office in Sandton to say hi before making a stop at the Soccer City stadium. You know what? The stadium is freaking awesome! We then plotted our new destination - Lesotho. If I have to be honest, the road conditions were miserable to say the least. The "B roads" were full of potholes, some the size of The Big Hole in Kimberley. The way in to Maseru was simply spectacular. The city is surrounded by mountains, providing another collection of brilliant scenery. 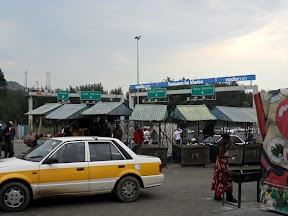 Once we were stamped through the border, I was shocked by the contrast. 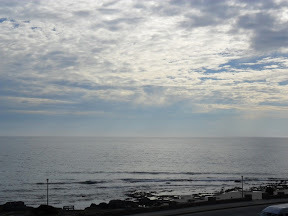 It was so hard to believe I was standing in a landlocked country within South Africa. It felt more like one of those movies or TV shows where they use Central Africa as a backdrop! I must say, though, it did have it's charms. So, we arrive at today, Thursday. We spent the morning at my friend's company's SA branch before setting the GPS for Bloukrans Bridge. What's there? Well, the highest bungee jump in the world! About 50 kilometres from our destination, it started to pour with rain. Even the highways became treacherous. My enthusiasm for the jump, something I've been wanting to do for years and years, suddenly evaporates - to my horror. 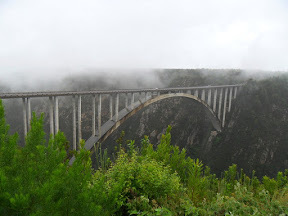 When we arrived at the immense bridge, the rain slowed to a drizzle but I was still not so interested in jumping when it's cloudy and wet. My friend went to sign the indemnity form and pay. In the meantime, I headed down to the viewing deck to see the bridge in its full magnificence to try and rekindle some of that fire again. It worked. I just couldn't pass up a chance like this, especially since I don't know when I'll be able to even get a chance like that again! So I signed off on the indemnity and paid. We harnessed up and I started preparing myself mentally for the jump. While we were waiting, the guys running the jump talked to us and they were all quite surprised that I'm from South Africa and I can speak Afrikaans quite well. It turned out that not thinking about the jump was the best thing to do. The time came, and we proceeded to trek up to the bridge and get on the under-bridge catwalk to the jump site. My friend had a horrible fear of heights so he not only turned a little pale, but refused to look down on the metal mesh catwalk. I had no issues to look down. The sight that greeted me was really breathtaking! I just can't describe looking down from so high up. It's not like the plane... You feel like you're walking on air over this amazing gorge. The guys talked me all the way to the ledge. I had to stand with my shoes about 5 cm over the edge. They counted before you could even object and the leap of faith. If anything went wrong, the end result is simply unimaginable! I shouted: "waaaaaah!" on my way down, but my voice just stopped when I realised that I didn't go down on a constant speed. In fact, I kept gaining pace, reaching something close to a 110 km/h free fall. And then the first bounce after plunging 216 metres! It was weird, it didn't feel too jerky as I expected, but I realised how uncomfortable it actually was with my head downwards. This prompted me to say out loud: "ooooph, this is uncomfortable..."
The next bounces wasn't so thrilling either and I started to feel faint as the blood rushed up the wrong way. So I kept pulling myself back up in a sort of upside-down vertical sit-up to keep my head in the upright position. There was some point when I felt the cable on my ankles a bit loose and slipping. But I'm guessing it's because it was tightened around my jeans and there was so give by nature. Weird and a little scary. But it was a leap of faith, so you just had to trust that the people know what they're doing. And then the guy came down to pull me back up. He talked to me as we were both pulled back up to the platform. At that moment I realised what I had done... 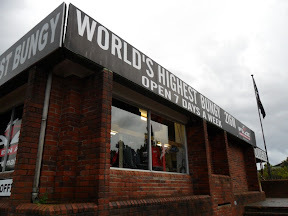 I jumped off the highest bungee jump in the world at 216 metres! When I finally got rid of the cables and stood up, I felt a wondrous rush. All sorts of adrenaline and dopamine filled my body and head. It was great! I was trembling, not from fear, but from absolute excitement! I couldn't shake my minor trembles for at least 30 minutes afterwards... A-W-E-S-O-M-E! We've now come back to Oudtshoorn. Tomorrow we'll go through the Kango Caves and then head back to Cape Town to complete our epic road trip. It'll be over soon, but the memories will last a lifetime! More photos of my jump will follow and the video when I get back to Brussels to convert my souvenir DVD.